I only went to go and get some fuel from the local filling station. But, on Britainís rapidly altering roads, a sharp-edged pothole had opened up on my well-trodden route, and in the dark and drizzle the left wheels clattered through it with a wince-inducing thump. It happens. But barely 15 seconds later, when the low tyre pressure warning chimed into life on the dashboard, it was pretty obvious what the cause was. Less than half-a-mile from home, I carried on slowly along the road, pulled up outside and slunk out of the driverís seat to witness the 6 Tourer sinking onto its nearside back wheel like a torpedoed ship. On closer inspection, the Bridgestoneís sidewall was slashed and Iíve never seen a tyre deflate so rapidly. With a tin of tyre foam and pump in the boot ñ it wasnít even worth taking it out of its holder on this occasion ñ a call to Mazda Assistance was on the cards. 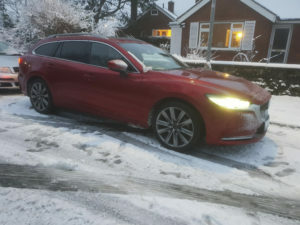 I spoke to a courteous chap who suggested the best course of action would be for the car to be recovered to the nearest Mazda dealership, and seeing as I was safely at my own home, would 1pm be alright? Right on time, the truck appeared and the stricken 6 was taken to Holdcroft Mazda in Stoke-on-Trent. The staff deemed it unlikely they would have a 19-inch tyre for the range-topping Mazda in stock, but that a courtesy car might be a possibility. Then, as much to their surprise as mine, a suitable tyre was found and within half an hour the Mazda was back in the car park. Problem solved. If I visit Holdcroft again, I may have to ask them about a rather strange issue with the Mazda, however. During the recent cold snaps, Iíve noticed it has a habit of freezing on the inside. While Iím fully prepared with ice scrapers, spray bottles and ëextreme performanceí screenwash to deal with ice in the morning, tackling a windscreen coated in a thick layer of frost is rather more troublesome inside the car. At first I thought I might have left something damp, or a takeaway drink, in the back, but with every possible culprit removed from the cabin, it hasnít solved the problem, and Iíve taken to using a loyalty card out of my wallet to remove the build-up. Once on the move, the Mazda is still proving a joy to drive, with all the controls feeling just right to me. The steering has a pleasant heft, without feeling artificial in any way, the pedals are perfectly placed and the gearbox feels precise and mechanical, although it is possible to fluff shifts, particularly when itís cold or if youíre too lazy, as it seems to like a firm shove. The engine continues to impress as well, and I love the linear surge afforded by its sequential turbochargers, hauling it out of corners, down slip roads and away from roundabouts with surprising punch. The punctured tyre was replaced with military-like efficiency. Dealing with a frozen interior is never a fun way to start the day.